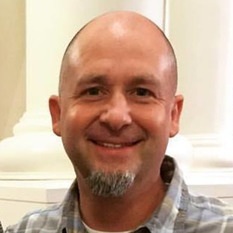 How does a white farm boy from Bumpville, PA (yes, a real place), come to live in the black Mecca of the US and give his life to racial reconciliation work in Christ? I have been asked this question recently and I’ve been working on the answer for over five years now and I want to share as brief as I can the journey Christ has led me through. 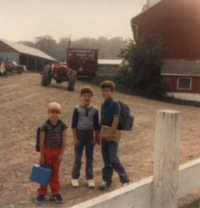 This is me in the middle of my brothers on the farm in Bumpville. The fact that I am standing there with no backpack and lunchbox perfectly describes my academic achievements in elementary school. I long for the body of Christ to be healed racially, and so because of that I wanted to record my journey and what has led me to this place. Every story and example I share below are true and each person has given me their permission to share how I’ve experienced being with them and seeing how racism has influence their lives. There’s actually many more stories that I could share, some of them have happened this past year as I’ve worked closely with the One Race Movement. After being mentored by leaders of color I began to read John 17 through the lens of race and realized that as the church are not one. After reading Howard Thurman’s Jesus and the Disinherited and Emerson and Smith’s Divided by Faith, I began to see differently and understand that we are not one. So, I began to question as to why we are not one? This led me to discover the history of our country based upon white supremacy and the reality of its demonic forces prevalent today. Here’s a description of my journey. My awareness of white supremacy started when I was eight and riding in the back of our families station wagon with my mom and brothers in the hills of Pennsylvania. We drove past a KKK meeting in a field just down the road from our church and my mom screamed at them out the window. I am not sure what she screamed, just that she screamed out of disgust for what they were about. I had no idea as to what they were meeting about. I believe we need more screamers and disruptors today over racism. The white moderate was Martin Luther King Jr’s main concern in his Letters from a Birmingham Jail. My first interaction with people of color was when our high school would host schools from the inner city of New York and Newark, NJ. We had a couple guys that were black stay with us in Bumpville, PA and see the farm and the Crain dome and I remember how much I enjoyed getting to know them and seeing things through their eyes. I was first really introduced to black culture and hip-hop from my black friend, Vaughn in college as a freshman. He was listening to a guy with a really neat beat. His named turned out to be Tupac. As a white farm boy from Bumpville, PA, being his roommate was a culture shock to say the least. But, that year we became good friends and had many late night conversations about black culture. I was attending a college football game in Orlando, FL with a friend of color and I remember vividly when the white guy in front of us started calling the black quarterback the N word. My friend and I just looked at each not sure what to do. I lament that I said nothing. My next experience didn’t come until five years later as I started to get to know a white guy named Nate who was a pastor at an all white church. Nate and his wife had moved into a black neighborhood in Grand Rapids, MI. One day we walked around his neighborhood and he educated me on why cities like Grand Rapids have Division Ave, what racial steering was, what red lining was, why his next door black neighbor was scared of Nate’s huge dog, Scooter. He was scared because cops had used German Shepherds on him when people of color would protest during Jim Crow. I then heard Pastor Marvin Williams, who was an African-American pastor in Grand Rapids, MI. speak at our white mega-church about loosening the chains of injustice from Isaiah 58 and talk about his experience of being a black man in America. He painfully shared about being called “boy” by a white man at a favorite breakfast place in Grand Rapids. The term boy is a racial slur dating back to Jim Crow. It was a power move by those older white men to keep this pastor in his place. I then had lunch with Pastor Marvin and asked him a hundred questions and he gave me a bunch of resources to begin to dig into a world that I knew nothing about. I then read Jesus and the Disinherited by Howard Thurman, which was a mentor to Martin Luther King Jr. and where the Civil Rights Movement found it’s theological underpinnings. I then realized that white people read the Bible a whole lot different than black people do and that when Jesus stands up in the synagogue and pronounces from Luke 4 that, “The Spirit of the Lord is on me, because he has anointed me to proclaim good news to the poor. He has sent me to proclaim freedom for the prisoners and recovery of sight for the blind.” Because of this I realized that my friends of color actually believe this. It was my white seminary professor from Grand Rapids Theological Seminary that said in fact that yes, Luke’s gospel was talking about the economic poor and disenfranchised, not just the poor in spirit. I then had the pleasure of getting to know Pastor Reggie Smith, a black pastor from inner-city Grand Rapids. He taught a class at our seminary about Urban Ministry. He then started to mentor me and continued to change the way I see Jesus, the gospel and issues of race. I then read Divided by Faith and once again realized that White Christians and Black Christians read a different Bible. One of the many things they unpacked as they did their research was the white church was the one that actually helped perpetuate the problem of race because of their complicity and that they need to focus only on spiritual issues like evangelism and discipleship. Unfortunately we are seeing history repeat itself as many white churches remain on the sidelines in this conversation on race. I did a paper on the New Humanity from Ephesians 2 and the reality that as a result of the gospel a whole new people group comes together in Christ. As I began to work through this text and actually think about the implications as to how they actually did this, I sensed the spirit about the importance of giving up power and control to one another. I then heard Tim Keller talk about the first time the word “Christian” was used was from Acts 11 and the reason was that Antioch was a city, which the different tribes hated each other. When the gospel, or the way of Jesus came to the city, a whole new tribe of people came together to be called “Christians”. Our whole name is unity out of diversity. Then all of this theory and study started to become reality when we moved into a black community and began to see systemic racism through the eyes of people we loved and walked with. I started to see young black men being treated differently and always get suspicious looks from people when we would walk into a restaurant together. One young man that’s black shared with me how frustrated he was that when he gets on a bus, white women will back away from him and clutch their purses tighter. I could sense that he was just tired. Then one day I came up on a young black friend in our neighborhood who was walking hurriedly down the street with a laptop. He hopped in my car and I asked him what was going on. He said he needed to get his laptop down to the store, a quarter mile away before it closed and he was in a hurry. I asked, why didn’t you just run down to the store. His reaction made me understand the problem on a deeper level. He said, “Dan, young black men don’t run through our neighborhood with laptops.” If they do, they will for sure get picked up by the police because they fit the description. Unfortunately, we just had something very similar to this station happen recently in our community. Then my very close friend who’s black shared painfully that his white coworkers wouldn’t look or talk to him at a recent car event here in Atlanta. Then I got to know a friend who’s black that has studied systemic racism for years (and lived it) and introduced me to the concept of “crabs in a barrel” to explain what’s happening in the city. This simply explains what’s happened as a result of racial steering and red-lining, which has created places where there’s no access to food, living wage jobs and housing, thus people react to the environment around them. Then the Trayvon Martin situation happened and I saw first hand how our black community around us felt and grieved over this. After this event I had an experience in which Devron, a young black friend that I have mentored and also learned from ran home down the main street in the neighborhood with his hoodie on because of the rain and he could easily be lumped into being a suspicious young black man because he was running with a hoodie. I then began to be mentored by Donna, a ministry leader who’s African American with years of experience in ministry and our conversations were so enlightening. It was her that told me about the conversation that black mothers have with their black sons about what they need to do when they are pulled over for driving while black. It wasn’t an issue of if, but when they would be pulled over. Then my friend who’s black who used to be a police office told me that after he finished his police training that a white police officer told him that he was going to go and shoot some “nig#$@’s”. I guess the white police officer forget that my friend was black. I then began to understand the huge problem of mass incarceration and the over criminalizing of black men in our country which is spelled out in detail by the documentary The 13th and by my friend, Dominique Gilliard’s brilliant book, Rethinking Incarceration. Then I was sitting in a meeting with seven black men at a historic black church in our neighborhood and one brother of color lamented that he cannot get a loan from a bank in Southern Georgia because it’s owned by white people. He then expressed the frustration that “white people have limited us.” Everyone looked at me as I was the only white guy in the room and all I could say was, “sorry”. Then I had a moment of dealing with my own prejudices and racist tendencies when I profiled an older black man that was pulling a suitcase trying to find a way into Park Tavern, a restaurant next to Piedmont Park in Atlanta. I assumed he was homeless and trying to panhandle for some food only to see his family following behind him. My own prejudices and racism came out in that moment. Then in light of all that’s been happening in our country and the senseless shooting of unarmed black men led to my friend and neighbor saying about the police force, they do it because they can get away with it, there is no accountability. I was at a lake house in Alabama for a weekend retreat with a friend who’s black and as we were cleaning up, we realized that our house had no trash can. My friend asked if I would be willing to go next door to see if we could use their trash can. Because of the confederate flag hanging outside the house, I asked if he was uncomfortable walking over there to ask. His answer was yes. It’s moments that happen when I am sitting in a lunch with a Pastor who’s African-American and a part of a large denomination in the US and listen to him share painfully about a Pastor who’s Native American and was just forced to cut his hair in order to be affirmed as a Pastor in this particular denomination. One needs to know just a little bit of history and colonialism to know this is pure evil. Because of this group and sitting and listening to the deep pain of my friends of color, it has allowed me to grasp how deeply imbedded racism is in our culture. The pain that my brothers of color showed during this space was palpable. One of the most moving moments was after one of our white brothers shared about a particular lynching of Jesse Washington in Waco, TX in 1914 and my black friend painfully shared in the group, “This is my DNA. This happened to people who looked just like me!” It was also painful and sobering when my white brother acknowledge that it was our tribe of whiteness that did this and we have benefited greatly from a system based on white supremacy. As I’ve developed out the Loving Freely concept, which is a resource on emotional health in the work of reconciliation, I’ve discovered the fact that the same stream of sin and selfishness that created white supremacy runs in me. Because of the fall of humanity and the problem of evil, the same evil that created slavery, KKK, Jim Crow, etc., is still in me because of my false self. My false self longs to control, manipulate, classify, profile, etc. for its own benefit that I might feel power over the other. Being a part of the One Race Movement Stone Mountain event was historic and amazing. Leading up to the event I asked my next door neighbor and friend, who’s also African-American what this event meant to her and with tears in her eyes, she said it means everything. She’s shared stories of her experiences with Jim Crow and what it means that the church is now taking racism seriously as a women in her 70s. Then just recently I sat and listened to a friend who works with young people of color lament that one of his students shared that he just wishes he was white. I’ve also learned from my hispanic and latino family that many times they feel left out of the conversation and feel like they’re constantly the third wheel in the body of Christ. This past year I’ve had the honor and joy of journeying with friend and Pastor Arthur Breland, the first black pastor at an all white Southern Baptist Church at Woodland Hills Community Church in our area as a co-leader in the One Race Movement. Arthur has taught me a lot of what’s it been like as a pastor of color leading in a white space. He’s talked about the pains of working under white leadership at his church as they’ve made racist jokes. He’s shared with pain of his struggle with the difference that people of color with addiction are treated differently than white people. People of color have been criminalized for drug addiction over the years while white people get treatment in today’s culture. I’ve learned from him to not let my whiteness kick in when we’re ministering together and just simply follow the work of the Spirit in meetings. It’s been a blessing to release control and allow the Spirit to guide us. Then, just recently I had the joy and honor of walking with my close friend of color down newly renamed United Ave from Confederate Ave. It was a joy to walk and sand with him and many others on a rainy Saturday morning. The reality is this, racism is deeply imbedded in our country and culture and it’s going to take a whole lot of prayer, conversations, relational and structural changes within and without the church to become what God intends us to be. Now, I keep learning and becoming the person Christ calls me to be in the midst of this chaos and division. I keep pursuing to live out the New Humanity in Christ through different avenues.